The living room is the room for entertaining guests, enjoying family interactions or just plain relaxing. It's a more cordial and comfortable place if you design it in a way to maximize the flow of good energy. Feng shui can help with that; in fact, that's what the ancient Chinese art of space harmonization is all about. The practice of feng shui is probably as old as Chinese civilization itself, and it's quickly gaining recognition as a home improvement tool in the fast-moving Western world. Traditional practitioners use compass maps to give consultations, but you don't need a detailed analysis of direction and elemental imbalances to make improvements that can make a big difference. It helps to have a background understanding of basic feng shui principles, but since most of the improvements will be commonsense ones, you'll be able to implement and appreciate them even if you haven't done any background reading. The word ch'i means energy in traditional Chinese culture, and regulating its movement around the house is one of the main goals of feng shui, if not the main goal. In the living room, which is usually close to the front door, ch'i tends to move too quickly, which makes it sha ch'i, or bad energy. To create a comfortable, inviting living room, you want to slow down the ch'i, but not too much, or it becomes stagnant, and stagnant energy is also sha ch'i. The opposite of sha ch'i is yun ch'i, which can be translated as good fortune or simply good energy. Elements that create yun ch'i include proper placement of furniture to create space and encourage interaction, balanced elements that don't allow any one to dominate, and colors that harmonize with the placement of the living room in the house and its role as a meeting place and a place to relax. Here are 12 feng shui tips that can help you create a more comfortable and inviting living room. Try them even if you don't know anything about feng shui. You'll probably notice a difference. A living room needs a couch, or else it's just a den or a recreation room. The couch doesn't have to be in the middle of the room, but it shouldn't be in a corner. It should be at least a few inches from the wall, never in front of a window, and it should have plenty of space around it for people to move. In the best placement, the couch occupies the power position, which means that anyone sitting on it has a view of the room entrance. A common warning about couches in living rooms is to avoid L-shaped furniture pieces. The reason is that the shape creates a poison dart by pointing at someone. Poison darts make people feel agitated and uneasy. This is a basic step in establishing a harmonious space according to feng shui principles. Miscellaneous items strewn about the room slow the flow of ch'i to a standstill. People feel confused, distracted and uncomfortable. A few magazines and photos are okay, as long as they are fairly current. In a living room with multiple entrances, ch'i tends to move too quickly, and items that attract interest slow it down. A few strategically placed crystals, pieces of art or flowers do this nicely. Stow everything else away. Good lighting promotes the flow of positive energy and poor lighting does the opposite. The windows should have curtains to prevent ch'i from leaking out, but the curtains should be open during the day. If the lighting is insufficient, use mirrors to magnify it and direct it where it's needed. At night, there should be more than one source of light. A combination of overhead lights, table lamps and floor lamps—perhaps even some wall sconces—creates layered lighting that boosts visual interest. The living room will be uncomfortable if it's drafty, but it shouldn't be stuffy. Provide at least two passages for air to allow it to circulate freely. Open the windows frequently to allow fresh air inside. Aromatherapy diffusers filled with essential oils help clean the air and banish musty odors. The color scheme should take into account the colors in the rest of the house —which you can decide with a feng shui consultant, if you're so inclined. They should also contribute to the mood of the space. It's generally best to use light colors, but accenting walls with darker shades is a good technique for rooms that are otherwise featureless. Colors have significance in terms of direction, and you can use them to balance the five elements. For example, deep blue is the color that represents water, and it's a good moderating influence in a very bright house in an arid location. Most feng shui practitioners recommend circular coffee table because square and rectangular coffee ones have corners that serve as poison darts. This isn't a hard-and-fast rule, because the square shape represents earth, which may be more appropriate and grounding in a bright room with a fireplace that is essentially dominated by fire. 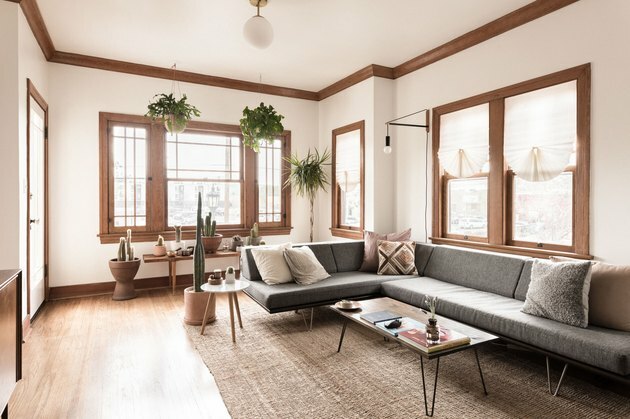 The coffee table should be close to the couch, preferably in front of it, and it should have space around it for people to move while being accessible enough for people to use. Sitting three abreast on a sofa isn't conducive to conversation, so the recommendation to provide chairs shouldn't come as a shock. You probably already thought of it. The chairs should be across from the couch or form a corner with it. If you want to create a contemplative space, you might set one chair apart from the others to provide a retreat. Be wary of placing more than one chair on its own, or you could create a separate conference area that detracts from the unifying presence of the couch. In feng shui, each shape represents an element, and a preponderance of a single shape upsets the balance. If you have a circular coffee table, you've introduced the metal element, and adding a circular mirror amplifies that element. Paint the walls gray, and you've got a cold, almost bleak setting. Adding other shapes can minimize that effect. A long couch represents wood, and if you can find a table with legs that splay out in a V-shape, you've introduced the triangular shape of fire. A square side table could represent wood. Cover it with a reed mat to represent the undulating, non-specific shape of water. Balancing the elements also involves color and other elements., so don't feel that every element has to be represented by a shape. The most important point is to avoid a noticeable bias in favor of a single shape. Mirrors do more than amplify light. They alter the visual field, so you can use them to deflect attention from defects, such as poison darts, and to compensate for design flaws in the architecture. For example, the entrance to the dining room may be right across from the main entrance to the living room, and people may tend to travel between the passageways as if they were in a hallway. A strategically placed mirror, reflecting the main part of the living room to people entering it, draws attention to the living room and discourages them from quickly bypassing it. In feng shui terms, the mirror slows down ch'i and helps it circulate in the living room. Directionality is important in feng shui, and proper attention to it establishes a naturalistic environment in which people feel comfortable and prosperous. You need a compass to establish the directions in your living room. Any compass will do, even the one on your iPhone. The south wall represents fire and fame and is obviously a good place for the fireplace. If the fireplace is elsewhere, adorn the wall with a dramatic piece of art. The north wall represents water and career and is the best place to hang any certificates or professional portraits you might want to display. The east wall represents wood, family and ancestors, so it's the wall for your family portraits. If you have plants, at least one should be close to this wall. The west wall represents metal, children and creativity. This is the best wall for your abstract art as well as any art that appeals to children. Plants introduce the wood element and they also serve to direct ch'i. Setting a plant near the entry to the dining room helps to separate it from the entrance directly across from it, If needed, you can separate the entrances by placing the plant directly between them. Some plants are better to use than others. Jade and bonsai trees invite prosperity, while ferns and palms purify the air. Spiky plants, such as aloe and cactus, are basically living poison darts and should be avoided. The last tip is the most comprehensive. The five elements— fire, water, earth, wood and metal— are present in nature, and all should be represented in your living room. Each is associated with a color and a shape, and of course, anything that physically incorporates the element. Balance doesn't mean all the elements are equally represented. It may be advantageous to lean heavily in favor of a particular element to offset the structural design of the room, the view from the windows, or some other factor you can't control. However, each element should have a distinct presence, preferably in its favorable direction. You can use one element to augment or diminish another. For example, a crystal, which represents water, helps diminish the presence of an overbearing fireplace, and in some cases, the combination can be magical. For another example, a fern, which symbolizes wood, can placed next to a brown wall to augment its earthiness and contribute to a feeling of fertility and vitality.